The Huntington is an invaluable resource and a place of beauty for all who visit. The library, art collections, botanical gardens, and educational programs combine to uphold one of its biggest priorities: preserve the past and protect the vision of founder Henry E. Huntington for generations to come. Craftsman Terry Eagan continues these values with his Faux Bois work in The Huntington Botanical Gardens. Faux Bois (false wood in French) is an age-old art form that uses steel and concrete to create a structure that looks deceptively like rustic wood. Traditionally in the craft, wood textures are freehand sculpted into the final wet layer of a medium such as mortar or grout. There are no molds or stamps, no casts of real trees or wood. 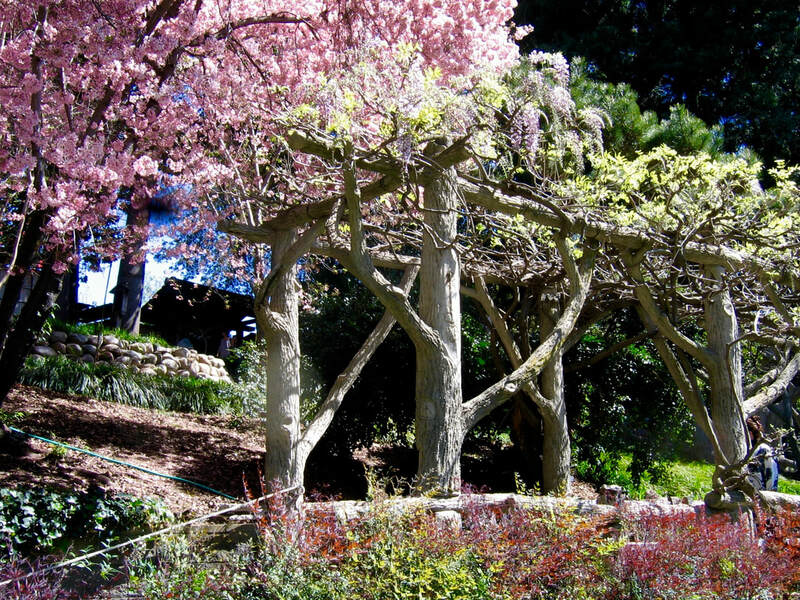 Beginning in March, 2010 with the Huntington's commitment to restore the Japanese Garden as it turned 100 years old, Terry began restoring the arbors that support the Wisteria. As the project continued, he began restoring the structure in the Rose Garden and has begun to add new work in the original style. The structures consist of a total of 100 "trees" plus the connecting "timber" beams and handrails. They were built on-site beginning as early as 1915 and on through the early 1920’s. It appears the properties of reinforced concrete were not fully understood. As a result, flaws left in the construction would cause some rusting steel which becomes evident after many decades. The project seeks to understand and correct these problems, with the hope to improve it in order to last for many centuries into the future. A unique aspect of the project, is that we do not have the names of who created it. This allows Terry to have some artistic liberty while restoring it. In one section, there is evidence that two artisans produced work that did not match each other. Terry is able to hide the more primitive work of the "apprentice" with new work that captures the essence of the more realistic "master". For the first time in 100 years, the whole collection will be a consistent "species" of wood. Throughout the project, Terry has approached his work with both a scientific and artistic perspective using trial and error, developing unique tools and techniques to achieve the best end result. This website shows how he has come to what is now his "process" and all that it entails. A page for history includes links to interesting facts about the origins of the craft of faux bois and to the invention of reinforced concrete.